Prayer, what do know about prayer? 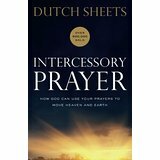 What is intercessory prayer? Dutch Sheets, a teacher and speaker, has put together a book that will answer these questions. Easy to understood and written to inform people about prayer and why and how the need for prayer is important.. He shares many stories of how people have prayed for many things and definitely seen answers. He does not say that they will be answered in the way you may want them answered or when they will be answered, but that there will be answered. He shares many miracles that he has seen and some that were shared with him. It is a great book for understanding prayer and how God will ask us to pray for many things by using the Holy Spirit and he (Dutch) uses scripture to make his point. The book is one of the best books about prayer that can you can find.